This article will cover the basic usage of AirMedia on a Mac. Open AirMedia. AirMedia should be found within the Crestron folder in the Applications folder. *Note* Instructions for installing AirMedia are available at the bottom of this article. 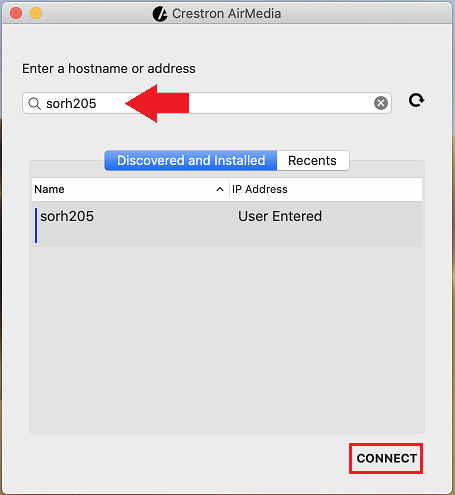 Type in the hostname or IP address of the desired AirMedia device. This information will be on the projected AirMedia screen. Click Connect. At the prompt, enter the passcode. This will be a four digit number listed on the projected AirMedia screen. You should now be projecting on the screen.